At the close of the French revolutionary and Napoleonic wars (1789-1815) the Bourbon dynasty was restored in France in the person of a brother of the King who had been sent to the guillotine during the revolution. This restoration King, Louis XVIII, alienated opinion due to his absolutist tendencies and his 'legitimate' monarchy was usurped in 1830 with a junior, 'Orléanist', branch of the dynasty being recognised as Kings of the French rather than as Kings of France. The King installed in 1830, Louis Philippe, was himself a son of Philippe, Duke of Orléans, a Bourbon prince who had offered some support to the revolution of 1789 and who had become known as Philip Egalité. Notably disagreeable weather across much of Europe in 1845-6 affected agricultural production leading to rising food prices and to generally depressed economic conditions of widespread unemployment. Such sufferings as this brought to those badly affected led, in turn, to a radicalisation of political attitudes. During these times France was yet a monarchy under Louis Philippe but with his "Liberal" monarchy having few real supporters. Elections were held on the basis of quite limited suffrage, many felt excluded from any possibility of gaining wealth, and others felt that his "Bourgeois and Liberal" monarchy compared unfavourably with earlier, "Glorious", eras of French Monarchy or Empire. Many persons in France were also alienated by a series of 'reactionary' foreign policy positions being adopted by Guizot as prime minister to Louis Philippe. On 14th January 1848 the authorities banned a "banquet", one of a series that had intermittently been held by 'liberal' interests after July 1847 in Paris, and subsequently widely across France, in protest at such things as limitations on the right of assembly and the narrow scope of the political franchise, with the result that the it was postponed by its organisers. There was actually a law in place requiring official permission for any meeting to be attended by more than six persons. Keep the laws as they are, if you wish. I think you would be very wrong to do so; but keep them. Keep the men, too, if it gives you any pleasure. I raise no objection so far as I am concerned. But, in God's name, change the spirit of the government; for, I repeat, that spirit will lead you to the abyss. The postponed banquet, now set for the 22nd February, was banned by the authorities at the last minute and there were some serious disturbances on the Paris streets on the 22nd and on 23rd February which featured the building of some formidable barricades by groups of protesting citizens. The were instances of units of the civilian National Guard that had been deployed by the authorities refusing to act to contain the protest. More serious turnings of events followed however - there was a number of fatalities and serious injuries after a group of soldiers fired their weapons directly into a crowd, (allegedly in a period of confusion after the accidental discharge of one of the soldiers' firearms), on the morning of the 23rd of February. Protestors subsequently threw up a large number of barricades in several areas of the city - chopping down thousands of trees and tearing up hundreds of thousands of paving stones in the process. There further widespread instances of members of the citizen National Guard siding with the protesters against the government's authority. Faced with such unrest Louis Philippe dismissed Guizot, his reactionary Prime Minister, who had been a particular focus of the protestors anger, on the 23rd and himself, reluctantly, abdicated on the 24th writing to the French Chamber of Deputies that he wished that powers of regency should be vested in a Duchess of Orléans, mother to the Comte de Paris (a nine-year-old grandson of Louis Philippe), to whom the French Crown would now pass. Although Louis Philippe had sought to abdicate in favour of his grandson this was not fully communicated to the Chamber of Deputies. The mother of this young Comte brought her sons to the Chamber of Deputies seeking the acceptance of the Comte de Paris as the next King of France. This seemed to be on the verge of unanimous acceptance but events took a different course after an armed and determined looking crowd composed of national guards, workers and students burst into the parliamentary chamber. The Chamber subsequently accepted that the forces seeking change could not be denied given the popular mood in a radicalized Paris and that the populace would not accept the establishment of the proposed regency. The Chamber of Deputies nevertheless opted to attempt to exercise influence over the developing situation with the hope of avoiding yet more serious outbreaks of civil disorder. Seven individual deputies that the Chamber of Deputies deemed capable of assuming responsibilty for overseeing political change as a "Provisional Government" were identified with the support of the Chamber. The Chamber of Deputies was largely led in this selection of members of a Provisional Government by the opinion of an influential liberal and reformist deputy named Lamartine (who had also, reluctantly, contributed decisively to the decision not to accept the young Comte as king). The members of the would-be Provisional Government then sought to present themselves at the Hôtel de Ville, or City Hall of Paris, in order to attempt, (as they deemed necessary), to take the initiative away from the perhaps excessively radicalized crowd which was gathered there. It was anticipated, by those delegated by the outgoing Chamber of Deputies to attempt to provide leadership necessary to help to prevent social chaos, that efforts at seizing the initiative were to be made through persuasion only. Those nominated to this task by the outgoing Chamber were variously men of established reputation as liberal reformists, as left-leaning radicals, or as men of science who, in the circumstances, accepted that they would only have their existing reputations and their political or persuasive skills to rely on in their project. The seven individuals who now took on the task of attempting to provide necessary leadership did so at some risk to themselves as they could fail to win over the dis-satisfied sections of the Parisian populace gathered at the Hôtel de Ville and could also stand to very seriously incur the displeasure of French conservatism through their actions. At this time those who might seek alarmingly radical change were undeniably in possession of the Hôtel de Ville against a background where some twelve thousand muskets formerly held within government arsenals had fallen into the hands of radicalized sections of the Parisian population. It happened that the crowd, tens of thousands strong, who gathered around the Hôtel de Ville in these days of political tumult were in the processes of setting up a "Provisional Government" of their own choosing. There was a possibility that the French army could be called upon by the deposed king's brothers, or some other conservative leaders, in order to attempt to stifle what many sections of French society might regard as unacceptably radical reforms that could well issue forth with the authorisation of a provisional government based in the Hôtel de Ville. What had effectively become a French revolution of 1848 continued with a new Provisional Government being formed in a climate where power needed to be exercised by a central authority but where there was also a divergence of opinion as to the desirable political and social outlook of that government. In the event the Parisian radicals accepted the arrival of the political men of established reputation who presented themselves at the Hôtel de Ville as the Chamber of Deputies' nominees for positions in a new government. At the Hôtel de Ville it was conceded that the previous monarchical government was overthrown and support for the establishment of a French Republic was publicly declared by Lamartine. This establishment of a Republic appears to have been viewed, in the circumstances, as politically necessary by the would-be Provisional Government. The new ministers at once set out for the Hôtel de Ville. At the Chamber of Deputies not once was the word "Republic" uttered in any of the speeches of the orators, not even in that of Ledru-Rollin. But now, outside, in the street, the elect of the people heard these words, this shout, everywhere. It flew from mouth to mouth and filled the air of Paris. The seven men who, in these supreme and extreme days, held the destiny of France in their hands were themselves at once tools and playthings in the hands of the mob, which is not the people, and of chance, which is not providence. Under the pressure of the multitude; in the bewilderment and terror of their triumph, which overwhelmed them, they decreed the Republic without having time to think that they were doing such a great thing. ... But they did not sign this rough draft. Their whereabouts had been discovered; an impetuous stream was surging against the door of the office in which they had taken refuge. The people were calling, ordering, them to go to the meeting-hall of the Municipal Council. There they were greeted by this clamour: "The Republic! Long live the Republic! Proclaim the Republic!" Lamartine, who was at first interrupted by the cries, succeeded at length with his grand voice in calming this feverish impatience. The members of the Provisional Government were thus enabled to return and to resume their session... The more ardent ones wanted the document to read: "The Provisional Government proclaims the Republic." The moderates proposed: "The Provisional Government desires the Republic." A compromise was reached on the proposition of M. Cremieux, and the sentence was made to read: "The Provisional Government 'is for' the Republic." To this was added: "subject to the ratification of the people, who will be immediately consulted." The news was at once announced to the crowds in the meeting-hall and in the square outside, who would listen to nothing but the word "republic" and saluted it with tremendous cheering. The next day, February 26th, in association with formally announcing its own appointment, the Provisional Government declared that "in the name of the French people, monarchy, under every form, is abolished without possibility of return." "....Neither the people of Paris nor the Provisional Government desire to substitute their opinion for the opinion of the citizens at large upon the definite form of government which the national sovereignty shall proclaim, 'L'unité de la Nation,' formed, henceforth, of all classes of people that compose it; the government of the nation by itself; liberty, equality, and fraternity for its principles; the people to devise and to maintain order - such is the democratic government which France owes to herself, and which our efforts will assure to her...."
Capital punishment was pronounced to be abolished in relation to political offences. Important figures in a newly formed Provisional Government administration included established moderate, liberal, middle-class, "reformers - now become republicans", such as Lamartine who became Foreign Minister. Another prominent member of the new government also derived from the "Provisional Government" initiated by the outgoing Chamber of Deputies including a well-known editorial contributor to the left-leaning La Réforme newspaper named Ledru-Rollin, (as Minister of the Interior), and an eighty-year-old veteran of the earlier years of revolution in France named Dupont de l'Eure. A campaign sponsored La Réforme, (which enjoyed considerable support across radicalized Paris), culminated in some more notably left-leaning persons, who had been seen by those already in place at the Hôtel de Ville as candidates for positions of authority prior to the arrival on the scene of the seven persons nominated by the Chamber of Deputies, also being accepted into the new government. These included the prominent French socialist Louis Blanc and a "working man" named Albert Martin who was popularly known as "Albert" and addressed by this forename all the while he was involved in the government. Dupont de l'Eure, who had been recognised by the Chamber of Deputies as their proposed figure-head of the new order, (and who had famously opposed the restoration of the French monarchy at the end of the earlier French Revolutionary and Napoleonic era), was installed as the leader of this new government. On the 25th February socialists in Paris secured a decree which proclaimed that the newly formed Provisional Government would undertake to provide opportunities for paid work for all citizens and would also recognise workers rights to "combine in order to enjoy the legitimate benefits of their labour". These revolutionary developments were perhaps more Parisian than French, they were orchestrated by a radical section of the population of Paris but they did not generally receive the support of the French provinces. After winning the recognition of the rights to work and to combine the socialistic radicals of Paris further urged the actual adoption of the red flag of socialism whilst those supportive of constitutional republicanism preferred to re-adopt the red, white, and blue, "Tricolour" flag that had been adopted in the early days of the French Revolution of 1789. Lamartine, who was something of a poet and orator later self-flatteringly recorded his own refusal, as a notably prominent member of the new government whilst faced with a turbulent crowd outside the City Hall of Paris during the late afternoon on the 25th February, in the earliest days of the new republic, to accept the red flag, which they saw as declarative of a commitment to a degree of socialism, as being a turning point in this debate. The above image depicts Lamartine in front of the Hôtel de Ville (i.e. 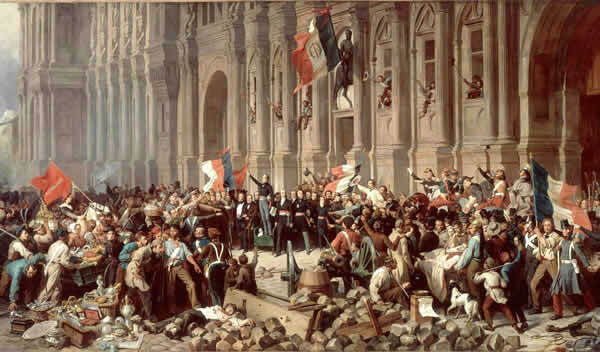 City Hall), Paris, on 25 February 1848, refusing the red flag. - painting by Félix Philippoteaux credited to the web site of the Académie of Strasbourg. ...As for myself, never shall my hand sign such a decree! I will push away until death this blood flag, and you should repudiate it even more than I will! Because the red flag that you have brought back here has done nothing but being trailed around the Champ-de-Mars in the people's blood in 1791 and 1793, whereas the Tricolore flag went round the world along with the name, the glory and the liberty of the homeland!" [In July, 1791 a red flag had, in fact, been actually flown by the authorities as a declaration of intent to impose martial law and order hence "the people's blood in 1791 and 1793". The followers of the radical Jacobin movement protested the authorities actions of July, 1791, by flying a red flag to honour the "martyrs' blood" of those killed as a result of developments following on from the imposition of martial law. The stresses incidental to this divergence of aspiration and outlook between Republicans and Liberals on the one hand and Socialists on the other nevertheless resulted in a compromise resolution where the old revolutionary slogan Liberté, Égalité, Fraternité was to be featured on the flag and a "socialistic" red rosette was to be added to the standard carrying this modified tricolour and where figures of authority would take it upon themselves to wear red rosettes. A system of "National Workshops" was instituted on 26 February in relation to this guarantee of "labour to every citizen". On 28 February, Louis Blanc, as the chairman of a Commission of Labour, was entrusted, assisted by Albert, with an influential role in the regulation of working conditions. Freedom of speech, association and assembly were proclaimed. Some political prisoners were released. On 2 March the Commission of Labour reduced the working day in Paris from 11 to 10 hours, and from 12 to 11 hours in the provinces. It was accepted, also on 2 March and in fulfilment of one of the key demands of the Banquet Campaign, that future elections would be based on universal adult (male) suffrage - a concession which recognised some nine million persons as being competent electors (compared to the 250,000 previously recognised voters under the previously much more restrictive rules suffrage). On 5 March it was agreed that elections to be held on 9 April would return delegates who would more fully decide the future direction of the governance of France. By order of a decree issued by Ledru-Rollin on March 13, certain aristocratic or bourgeois companies of the National Guard were to be disbanded and incorporated into the rest of the National Guard. Ledru-Rollin claimed that by authorising this measure he was acting "in a spirit of republican equality". Members of the National Guard companies threatened with disbandment marched to the Hôtel de Ville demanding that the decree be recalled but the government failed to oblige leading the protesting National Guardsmen to declare that they would return next day bearing their firearms. During the earlier French Revolutionary Era after 1789 political clubs appeared where like-minded persons could gather together with others who shared their political and social aspirations - the most notable of these having been the Jacobin Club. This precedent of 1789 was followed in 1848 in that many political clubs were formed in that year also. A French political activist named Louis Auguste Blanqui who was released, during the early days of the revolution of 1848, from life-imprisonment to which he had been condemned for diverse earlier radical and revolutionary activities, (he was actually sentenced to death early in 1840 but this was commuted to life-imprisonment), soon after his release founded a Société républicaine centrale which sought the establishment of a more radical form of government. The Société républicaine centrale, which grew in membership to some five thousand persons and was one of the largest political club of these times, twice petitioned for postponement of the election of a constituent assembly, stressing the need for time to educate the masses. Citizens, we demand the adjournment of the elections for the constituent assembly and the national guard. These elections would be derisory. In towns, the working classes, conditioned to subjugation by long years of repression and poverty, would take no part in the voting or else they would be led to the polls by their masters like blind cattle. Out in the countryside, all the influence is in the hands of the clergy and of the aristocrats. The people do not know; yet know they must. This is not a task to be accomplished in a day or even a month. When counter-revolution alone has had the right to speak for half a century, is it too much to give perhaps a year to liberty? From Deuxième pétition pour l'ajournement des élections, by the Société républicaine centrale, issued on 14 March 1848. In the event the elections were actually postponed to be held, on the 23 April, two weeks later than originally intended after Parisian radicals under Blanqui's leadership added to the provincial impression of potential Paris-based anarchy by invading the Hôtel de Ville (17 March) seeking a two-month postponement to allow more time for nation-wide electioneering. Whilst such reformists were, in principle, in favour of Universal (male) Adult Suffrage they were also fearful that the conservatism of the countryside would return a preponderance of conservatively inclined delegates to the new assembly. Due to personal animosities or leftist doctrinal rivalries neither Ledru-Rollin nor Louis Blanc had thrown their undoubted influence behind Blanqui's attempts to secure a longer postponement. In mid-April the National Guard, which had been adapted as Ledru-Rollin intended through the re-assignment of the individual members of its aristocratic and bourgeois companies, and in a situation where each individual Guard company had recently "democratically" elected its own officers, nevertheless supported the government mobilising 130,000 strong to contain "a day of action" seeking the dismissal of the present government being held by some 100,000 persons drawn from the political clubs and also more widely from Parisian society. The French revolution has thus entered upon its definitive period. France is a republic. The French republic does not require to be acknowledged in order to exist. It is based alike on natural and national law. It is the will of a great people, who demand the privilege only for themselves. But the French republic, being desirous of entering into the family of established governments, as a regular power, and not as a phenomenon destructive of European order, it is expedient that you should promptly make known to the Government to which you are accredited, the principles and tendencies which will henceforth guide the foreign policy of the French Government. The proclamation of the French republic is not an act of aggression against any form of government in the world. Forms of government have diversities as legitimate as the diversities of character - of geographical situation - of intellectual, moral, and material development among nations. Nations, like individuals, have different ages; and the principles which rule them have successive phases. The monarchical, the aristocratic, the constitutional, and the republican forms of government, are the expression of the different degrees of maturity in the genius of nations. They require more liberty in proportion as they feel equality, and democracy in proportion as they are inspired with a greater share of justice and love for the people over whom they rule. It is merely a question of time. A nation ruins itself by anticipating the hour of that maturity; as it dishonours itself by allowing it to pass away without seizing it. Monarchy and republicanism are not, in the eyes of wise statesmen, absolute principles, arrayed in deadly conflict against each other; they are facts which contrast one with another, and, which may exist face to face by mutually understanding and respecting each other. ...... The treaties of 1815 have no longer any lawful existence in the eyes of the French republic; nevertheless, the territorial limits circumscribed by those treaties are facts which the republic admits as a basis, and as a starting-point, in her relations with foreign nations. But if the treaties of 1815 have no existence - save as facts to be modified by common consent - and if the republic openly declares that her right and mission are to arrive regularly and pacifically at those modifications - the good sense, the moderation, the conscience, the prudence of the republic do exist, and they afford Europe a surer and more honourable guarantee than the words of those treaties, which have so frequently been violated or modified by Europe itself. Endeavour, Sir, to make this emancipation of the republic from the treaties of 1815, understood and honestly admitted, and to show that such an admission is in no way irreconcilable with the repose of Europe. [The other European powers, and particularly such deeply conservative ones as Austria and Russia, could, by such statements see considerable potential for their own previously pacific peoples being encouraged and even incited by dangerous French examples. The other European powers would have been aware that the new French government was being lobbied by radical Poles, Germans, Swiss, Greeks, Magyars, Romanians, Portuguese and Spanish in search of what they would have regarded as "revolutionary" assistance. Other interests in France criticised any friendship with Piedmont-Sardinia as it held "French" Savoy and similarly criticised co-operation with Britain which had sought to domestically contain both constitutionally reforming "Chartism" and also Irish national aspirations. They would also have been aware of the spontaneous formation, within France, of several free corps, or irregular legions, variously committed to bringing their idea of liberty to the Belgian provinces, to Savoy, and into the Germanies]. The republic pronounced at its birth, and in the midst of a conflict not provoked by the people, three words, which have revealed its soul, and which will call down on its cradle the blessing of God and man: liberty, equality, fraternity. It gave on the following day, in the abolition of the punishment of death for political offences, the true commentary on those three words, as far as regards the domestic policy of France; it is for you to give them their true commentary abroad. The meaning of these three words, as applied to our foreign policy, is this: the emancipation of France from the chains which have fettered her principles and her dignity; her reinstatement in the rank she is entitled to occupy among the great powers of Europe; in short, the declaration of alliance and friendship to all nations. If France be conscious of the part she has to perform in the liberal and civilising mission of the age, there is not one of those words which signifies war. If Europe be prudent and just, there is not one of those words which does not signify peace. In early May the situation in the Italian peninsula where the Piedmontese-Sardinian kingdom had come to blows with the Austrian empire seemed to have pressing foreign policy implications for France. On May 1, against a background where Piedmont-Sardinia seemed to be on course to acquire the rich province of Lombardy thereby greatly enhancing its power, Lamartine informed the British ambassador that "France might well expect some small compensation in the way of security, if so powerful a neighbour as Sardinia would them become was established on her Eastern Frontier within forty miles of Lyon". The settlement to the French Revolutionary and Napoleonic wars, as concluded in 1815, had returned Nice and Savoy, (and with them several strategically critical Alpine passes and coastal roadways Nice and Savoy controlled), which had been seized by France during those years of French Revolutionary and Napoleonic turmoil, to Piedmontese-Sardinian possession. (The dynastic house that ruled in Piedmont-Sardinia was known as the House of Savoy which used to be only a Ducal House of Savoy until their dukes got a kingly upgrade principally as a reward for their involvement in a number of coalitions which prevailed in a series of European dynastic wars of succession). It would become a pressing policy objective for France to again administer these territories, with their control of the Alpine passes and coastal roadways, as enhanced security against a newly empowered neighbour. The National Workshops system, which was awarded an initial budget of five million francs, (only consistent with the enrolment of some ten to twelve thousand persons! ), set out to offer constant work and soon, despite the wages being only at or about basic subsistence level, attracted the services of much of the casual labour of a Paris where economic dislocation was being experienced as diverse forms of private spending fell away in these uncertain times. The fall off in expenditure by more affluent persons in many cases resulted from their having left the turbulence of Paris for what they hoped would prove to be the relative tranquillity of the countryside. The number of employees of national workshops in Paris grew from 6,000 in early March 1848 to 25,000 on March 31, to 90,000 in May. The main initial task tackled in Paris itself being a public works scheme levelling a small hill - a scenario that did not involve the receipt of revenues to offset the expense to the public purse. Other tasks included planting trees, building roads, and building railway stations - the authorities even oversaw the performance of "the same tasks" over and over to provide sufficient paid occupation. They did not want to sponsor economic activities that might seem to be in competition with the interests of existing capitalist enterprise. As there proved to be insufficient work provided by the National Workshops for all the facility was rationed in that those involved reported to the workplace on two days of the week but were recognised as being entitled to a 'salary of inactivity' payment of one franc per day for other days. Some higher levels of taxes were authorised in the spring of 1948, that was land related and mainly impacted upon the rural peasantry, in efforts to help to meet the expense of the National Workshops. Many amongst the rural peasantry were already living lives close to the poverty line and found such increases in taxation to be hard to bear and were consequently ready to denounce the National Workshops and other expensive programs they could blame for the imposition of this unwelcome taxation. Ledru-Rollin, as Minister of the Interior, used the powers of his office in efforts to guide the results of the elections to the incoming National Assembly towards a radical outcome. A circular issued by Ledru-Rollin without the knowledge of his colleagues in government, to the provincial Commissioners, (by whom he had replaced the Prefects of the Monarchy), gave the first open indication of this alarm being felt by radical reformists about the potential outcome, and of the means of violence and intimidation by which the party which Ledru-Rollin represented hoped to impose its will upon the country. The Commissioners were informed in plain language that, as agents of a revolutionary authority, their powers were unlimited, and that their task was to exclude from election all persons who were not animated by revolutionary spirit, and pure from any taint of association with the past. Although this circular was issued by Ledru-Rollin without the consent of those with whom he shared governmental authority its contents were widely publicised so moderates in the government, and indeed across France, were left in no doubt that Ledru-Rollin was seeking to bend the rules in favour of a radical outcome. ...Paris looks on herself, with reason, as the representative of all the population of the national territory. Paris is the advanced post of the army that combats for the republican idea. If anarchy works in the distance - if social influences pervert the judgment or betray the will of the masses of the people, dispersed and scattered, the people of Paris believe and declare themselves guardians of the interests of the whole nation.... "
In the event neither the delay in holding the elections nor Ledru-Rollin's questionable electoral involvement proved sufficient to provide the outcome the radically reformist parties desired. The National or Constituent Assembly resulting from the processes of election convened on May 4th 1848. Some 900 deputies from across the provinces and cities of France had been returned to serve in the National Assembly with some eighty four per cent of the eligible voters actually casting their votes. Those voted in to the new assembly, by elections held under universal male adult suffrage, were returned from electoral constituencies that varied in being rural or urban and in localised traditions of affiliation to monarchy or church. Whilst the overwhelming majority of those elected had conformed themselves to the newly proclaimed 'Republican' situation about half of the new delegates were previously political figures who had given support to (Orléanist or Legitimist) monarchy. Some 350 of the new delegates were returned on a clericalist 'freedom of education' ticket favouring a central role for the (Catholic) church in education, there were only a minority, about 150 strong, of variously committed republicans or socialists. Despite the breadth of the franchise, that had recognised some nine million persons as being voters, the main voting bloc - the peasantry - proved to be content with the legacy of the 1789-1815 French Revolutionary and Napoleonic era that had left them as owners of their small farms with the result that they generally voted for conservative candidates that would not threaten the rights of property. In these times of widespread illiteracy the political opinions of rural voters were often considerably guided by respected local figures such as parish priests. Increases in taxation already authorised by the provisional government faced with an emergent economic crisis in these unsettled times had included increased land-taxes which impacted particularly on the rural peasant rather than the urban poor - further blighting the chances of government aligned candidates in rural areas. "Citizens! Representatives of the people! The Provisional Government of the Republic comes to incline itself before the nation, and to render conspicuous homage to the supreme power with which you are invested, Elect of the people! Welcome to the great capitol where your presence excites a sentiment of happiness and hope that will not be disappointed. Depositaries of National Sovereignty, you are about to found new institutions upon the wide basis of the democracy, and to give to France the only Constitution that is suitable to her - that of the Republic." Given the political and societal realities of the times delegates may have been returned to the new assembly with differing hopes for the future of France as a republic or as a monarchy. Dupont de l'Eure's recommendation towards republicanism was in line with the mood of the hour for some: and for others may have represented a pragmatic outcome decreed by the force of circumstances. 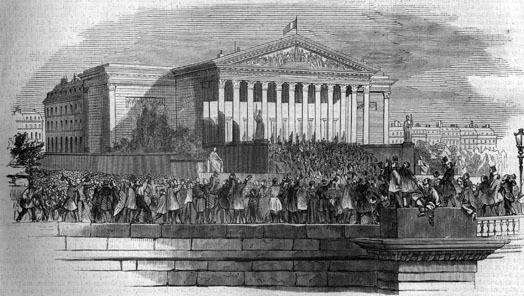 The first day's session of the National Constituent Assembly was actually brought to a close in a dramatic scene where the delegates, at the suggestion of the Commander-in-Chief of the National Guard, gathered together outside on the steps leading up to the building that had previously housed the Chamber of Deputies. From those steps, in a part of central Paris with views of many impressive buildings and monuments, many of which lay across the river Seine which flowed beside the assembly, the delegates, standing together on a balmy early summer evening with bands playing in the background, gave voice to an unanimous shout of Vive le Republique! [Historians and statesmen tend to see French political life as featuring a strong tendency to yield to the claims of the state. A strong state being seen as vastly preferable to one distressed by open dissensions such that loyalty should be given to the government in power even by those who might privately have reservations about its desirability. French history had featured wars of succession and of religion and several instances of revolution - against this historical background yielding to the claims of the state seemed to offer hopes of national self-preservation whereas if parties and groups contended for their own preferences it seemed much ruinous anarchy might well result. Modern French historians have even been known to refer to this political situation as being one of a "Republic without Republicans".]!!! "My friends and I have neither made the Republic nor desired it, but we accept it; we accept it honestly and sincerely. The form of government which we strove for is broken, but under the present form, as under forms which have previously existed, we will endeavour to realize the best interests of our country". It proved to be the case that the recently elected political representatives of France as a whole were not prepared to endorse many of the policies that were preferred by Parisian radicals. The administration recognised by the incoming assembly did not include an important role for Louis Blanc. Lamartine at the time the assembly met for the first time was clearly the most popular public figure in France, although offered nomination as temporary President of the Republic by the new assembly Lamartine unexpectedly declined! Just as he had taken risks in pursuit of a moderate liberal transformation of French society by being prominent amongst the seven individuals nominated by the former French Chamber of Deputies who had won acceptance as authority figures by those gathered at the Hôtel de Ville in the early days of the 1848 revolution, and again in declining to accept the red flag as the banner of France, Lamartine now again took a risk by opting to align himself in some ways with Ledru-Rollin, (and the leadership of some of the political clubs), maintaining that France should invest executive power in a committee and making it plain that he, himself, would not serve on such a committee unless Ledru-Rollin was also on that committee. Lamartine, by these decisions, seems to have been prepared to move away from the political moderates, in the hope of achieving a broad "national solidarity" consensus after committee discussions where he could use his charm and persuasion to establish containing limits to the policies being pursued by politically committed radicals. By pursuing this course, however, Lamartine compromised much of his popularity in exchange for the naturally somewhat conservative incoming assembly overcoming a marked reluctance to award a prominent political role to Ledru-Rollin. On May 15th the National or Constituent Assembly was invaded by persons seeking social reforms at home and greater French aid for Polish independence abroad but, when their appeals were not given a favourable hearing by the National Assembly, veered towards its overthrow and its replacement by an administration headed up by radicals and republicans. In the event the National Guard acted quite forcefully to achieve the suppression of the would-be revolutionary government. Some radical leaders were arrested and, in cases, jailed. Radicalism had showed a willingness to attempt to turbulently impose its own agendas. The stage was now set for a continuance of a serious confrontation between French conservatism and Parisian radicalism. Given this scenario the monarchists, (legitimist and Orléanist), and the moderate republicans agreed to establish a more prominent role, in Paris itself, for the French army vesting many powers in a forty-six year old General Cavaignac on whom they believed they could rely to defend the continued functioning of the National or Constituent Assembly. Some weeks later, a most serious confrontation between conservatism and radicalism, - that became known to history as the "June Days" - took place between 23-26 June 1848 on the streets of Paris. Some details of this confrontation are presented in the earlier paragraphs of our Widespread social chaos allows the re-assertion of Dynastic / Governmental Authority - page. Of the works of this mind history is the record. Its genius is illustrated by the entire series of days. Man is explicable by nothing less than all his history. Without hurry, without rest, the human spirit goes forth from the beginning to embody every faculty, every thought, every emotion, which belongs to it in appropriate events. But the thought is always prior to the fact; all the facts of history pre-exist in the mind as laws. Each law in turn is made by circumstances predominant, and the limits of nature give power to but one at a time. A man is the whole encyclopaedia of facts. The creation of a thousand forests is in one acorn, and Egypt, Greece, Rome, Gaul, Britain, America, lie folded already in the first man. Epoch after epoch, camp, kingdom, empire, republic, democracy, are merely the application of his manifold spirit to the manifold world.